It all sounds a bit insane down in Belfast tonight. It is a bit crazy here but with Belfast being so tech savvy it has a constantly updated twitter feed #belfast. My favourite was when someone tweeted that they were going through a scary landing at the city airport in a prop plane in gale force winds as they saw all the lights of Belfast flicker (I nearly spelt that flickr, oh dear). Scary end of the world stuff. A pupil came to me today with a cake made by her mother. It was to say thanks for giving up our time at the weekend to take her daughter up into the mountains. I have to say I was impressed. This was no ordinary thoughtful gift, this had time and effort and chocolaty goodness in it. It went down well with the teachers in the science department. Some of these teachers took no part in the weekend but we let them enjoy it as their post event encouragement seemed to flow easily. It is hard to imagine that only a few tents were the shelters only a few days ago. It is a reminder of how the Northern Ireland weather is so bizarre this time of year all the time. As I write this I have a snowy gale blasted view out my window. It even seems to have the dim blue shades of a winter day. Reading some of my feeds today reminded me of the Lake District six months ago. Simon Cox’s post rings true for me when he writes about immersing himself in the mountain craft for a week on his ML assessment and then returning to the world afterwards. I also remember the weird return to normal life that seemed to flow quite happily when I was away and so focused that I hardly had time to ponder what was happening in the real world. On a similar note I noticed that Tollymore has updated its website. I can’t praise Tollymore enough. The lovely Sharon and I have been there plenty of times and have always enjoyed the courses. Very professional, lots of learning and lots of laughs along the way. I am looking forward to us going on a course there sometime when the new centre is finished. It looks amazing. I am not happy that I have finished this book, because it has finished. I even tried to slow down in the last chapter. I have a habit of reading aloud to the lovely Sharon when I find interesting bits. Whether she likes it or not I can no longer tell as she has been worn down by my bombardments and protests no longer. Although I am glad that she still shares her thoughts on the actual content of what I read. She found John Lister-Kaye a little too poetic for her liking. I can see where she is coming from with this critique but it is the lyrical and poetic images of this book that I loved. 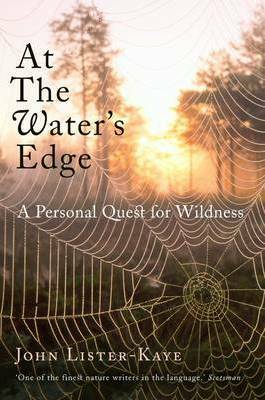 Between the flow of this writing are interesting insights and stories of the natural world around us. At least I am comforted by more books by the same author that I have not read. The following passage is not one of the most poetical but it did stand out in my mind enough to dog ear the page. The ascent of man has always been at the expense of the natural world; we have always destroyed our own habitat and the fellow creatures that would share it with us. But for most of human history the world was a big enough place to absorb our impact and to repair the damage as fast as we laid waste. When we felled forests they grew up again. When we broke camp and moved on to a new abode nature strode in behind with the beneficent process of re-colonization and restoration. We left nothing behind us but ash, bone, redundant timber, dung and clearings, all of which nature can cope with in a flash. Then Civilization strode into the arena. In awe of its compelling logic we stepped away from nature and abandoned the wild that had served us so well. We pillaged the forests to build great cities. The advancement of knowledge and the birth of science and technology seemed to be everything we could have wished for, matched in scope only by the conceit and complacency that spawned it. What we had not bargained for were the numbers of human beings that would arise as an inevitable consequence of advances in medicine, energy production and global mobility. Nor had anyone given thought to the space we would need to feed those ever-expanding populations. We lived with the grand assumption that there would always be enough land-water-food-natural resources for us all. For long enough there were. For several thousand years ‘Moab was our washpot and out over Edom did we cast our shoes’. Tonight as I was standing in the garden I was also reminded of another part of the book that interested me. As I looked up at the full moon I thought of part of the book about mammals and the moon. It seems that nocturnal mammals have a cycle of activity that is tied to the moon. Specifically a period of activity of feeding during the dark nights of the new moon and a period of relative inactivity during the bright full moon. And, as they have less potential food during a full moon, the common predators of these nocturnal meals are also less active. Are all these little creatures tonight hiding away in sleepy torpor? With a bus full of pupils Friday morning began by heading for the hills. Although I drew one of the long straws and got to drive to the hills separately, behind the bus. Once we had all spilled out at the foot of the hills we began to diverge into little groups in all sorts of directions, keeping one eye on the sky and mumbling to the weather gods. As the day went on I felt a cold virus begin to grip. It had been knawing at me all week but now began to take huge bites out of my general wellbeing. By the time evening came I retired to my sleeping bag early and very weary. Not an ideal state to be in. I may not have got into the high mountains that day but I did get to see the forest in early spring. I may not have had much of an appetite but I had enough of an appetite to slowly graze through handfuls of fresh wood sorrel and let the rivers and strams help heal me. Is wood sorrel it a good source of vitamin C? Today was a day sustained by strong black coffee and lockets. Every single minute of a full (no free periods) day was filled by demonstrations on the art of packing rucksacks. Bags begin by being bulging with tents and sleeping bags strapped to the outside. They insist and scream in tantrums that it simply is impossible to pack. Often all the toys are thrown far from the pram. A few minutes later I pass back to them their rucksack with everything neat, tidy and squared away. They respond with withheld awe and a hint of suspicion, as if I have conned them or tricked them as a quick handed magician would.